Reserve your room using the online campus housing system. To start the process, you may log in and fill out the housing application. Begin by selecting your term and confirming or adding to your information. You can also request ADA accommodations if necessary. Returning residents: Fall 2019 applications open on February 28, 2019. New students: Fall 2019 applications open on March 14, 2019. The freshman fall housing priority deadline is May 1, 2019. After May 1, rooms are available on a first come first served basis until we are full. The ADA fall housing priority deadline is May 1, 2019. After May 1, we will continue to accept requests for ADA housing, however we may not be able to meet all requests by fall quarter. Winter and Spring: applications open at 5 pm on the Friday of the previous quarter's evaluation week and end at noon on the Wednesday before the quarter starts. See the Academic Calendar at a glance for specific dates. Summer housing is handled through a special process. See the Summer Housing page for more info. 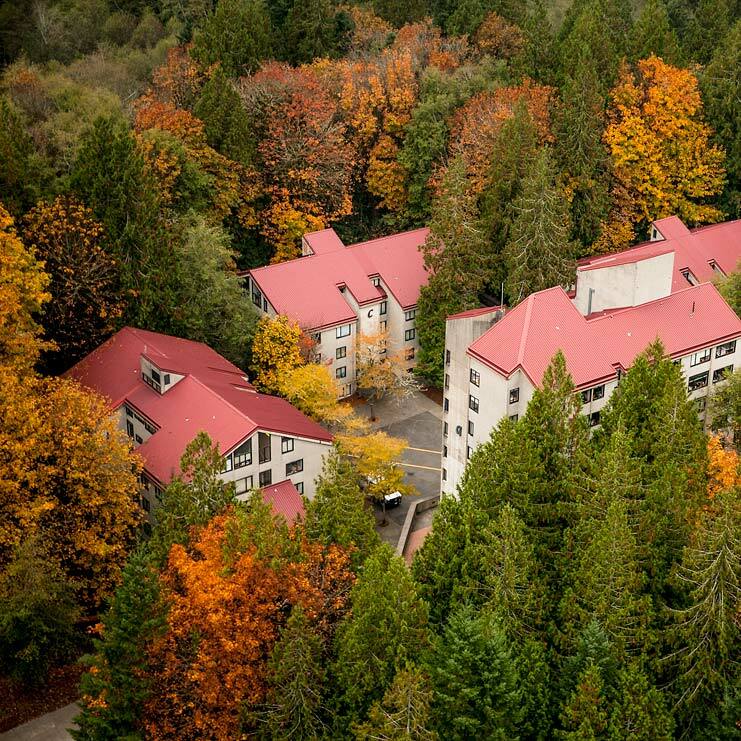 To use the online campus housing system, you must be admitted to Evergreen and have an evergreen.edu email address. Log in to the campus housing application. Fill out our form providing basic information about yourself, and select your meal plan for the year. Meal plan requirements vary, based upon where you live. Students living in the residence halls without kitchens must select a large plan that at least covers most of their meals. Students living in the Apartments without kitchens may also select smaller meal plans as low as $250/quarter in declining balance. Select your own space in the apartments from a map, or tell us your preferences and join the list to be assigned a space in the residence halls. Let us know in the application if you have any roommate requests. Make sure your friends also request you and apply around the same time. Follow the instructions to make the required payment within 48 hours and lock in your room. A non-refundable booking fee and non-refundable rent down payment will be assessed to your student account. $50 booking fee pays for system processing. If you do not pay the non-refundable booking fee and non-refundable rent down payment in full, these charges will be backed out of your student account and you will not have a room. If your financial aid expected family contribution is under $5080, you may be eligible to defer the rent down payment and booking fee. Contact us for more information about the deferred payment agreement. After you apply for housing, we’ll send important messages to your evergreen.edu email address. You can forward your evergreen.edu email to another address. Information about rent and meal plan billing. Roommate contact information available in early September. Other information about living on campus. If you’ve already booked a room but change your mind and are not planning on living with us, cancel your application and avoid being billed for rent. What if I can’t pay the booking fee and rent down payment within 48 hours? If you are eligible for financial aid, download the Deferred Payment Agreement (PDF), fill it out, and bring a signed copy (or email a photo of a signed copy) to the housing office. The non-refundable booking fee and non-refundable rent down payment will still be assessed to your student account, but they won’t be due until you receive your financial aid and rent is due. As we are holding a room for you that we are not able to offer to other students, the charges are non-refundable even if you decide to cancel your room.